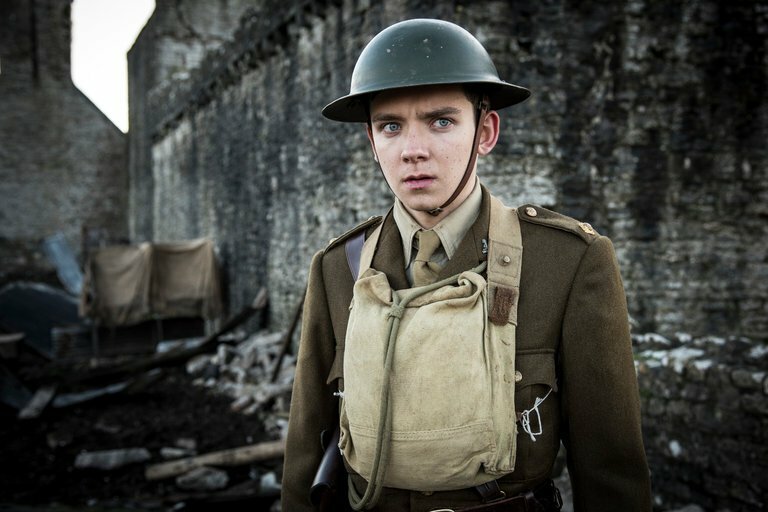 Asa Butterfield in Journey's End. This year marks the 100th anniversary of the end of World War I. I haven’t heard much retrospective reporting about it, unlike the endless rehashings of events from 1968, though there is a lot we could still stand to learn about “the war to end all wars,” which set a standard for raw slaughter the likes of which the world had never seen. Two new films opening this weekend look at pieces of the conflict, in styles and perspectives that couldn’t be more different. The British drama Journey’s End has an unshakable claim to authenticity: It is based on a play and a novel by R. C. Sherriff, who was an officer in the British Army during the war. In March of 1918 the war in northern France is deadlocked. Rumor has it that Germany is preparing a massive attack to break through the stalemate, an attack that the British and French will not be equipped to resist from the trenches where they have been dug in for long months. This story takes place in the few days before that attack, as Company C takes their turn in the trenches. After years of fighting, they are little better than holes in the mud, and the nerves of the officer in command, Captain Stanhope (Sam Claflin) are shot. He has taken to a steady diet of whiskey because “I can’t stand to be fully conscious all the time.” He has stopped writing to his fiancé and is shocked to find that his company has just been joined by her brother Raleigh (Asa Butterfield). Fresh out of training, Raleigh pulled strings to get to serve with a man he has always considered an older brother. Stanhope isn’t quite so happy to see him: He knows there’s little chance that the younger man will return home alive. As directed by Saul Dibb, Journey’s End is not about fighting but the effects of it, both after the fact and in anticipation. We now call it PTSD, except these soldiers are still in the midst of traumas. Scored primarily with a keening cello, the movie was filmed with natural light (candles in the grimy bunkers where much of it takes place) and handheld cameras, with a perspective that is, with a final exception, never beyond that of the men in the frame. Yet the result is never so grim that we are able to distance ourselves from it, shutting down in face of the horror to come. Though it takes place at the same time and on essentially the same terrain, Sgt. Stubby: An American Hero could hardly be any more different. For one thing, it’s a computer-animated feature, done in the familiar Pixar style (by a new company called Fun Academy Studios) though rather less accomplished. It’s based on the true story of a street dog, a bull terrier mix, that won the hearts of recruits in training for the 102nd Infantry and accompanied them to the war in France. Even allowing for fanciful reporting by the press of the time that probably exaggerated his accomplishments, Stubby did his share to help his bipedal comrades by providing early warnings of gas and missile attacks, locating wounded soldiers on the battlefield, and even capturing an enemy. Despite an injury he survived the war and was widely feted afterward. That the animated pup is adorable goes without saying: any animator who can’t design a heart-grabbing dog needs to get into a different business. And the movie is largely unobjectionable, which is an accomplishment for any mass-market war movie: Jingoism is minimal, and the drudgery of battle is emphasized over heroics. But it’s still sanitized—the only death that occurs is so discreet that you could easily overlook it if not for the weepy music. That it occurs in the 12 hour period between the announcement of the armistice and the official start of the cease-fire counts as giving food for thought to youngsters who the movie is otherwise only trying to entertain.